These days it seems like we're constantly seeing gorgeous images of the Earth from space. It wasn't always that way. 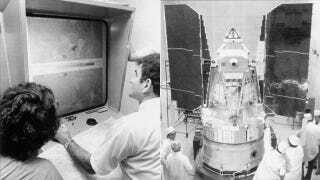 On July 23rd 1972, NASA launched ERTS-1 satellite into space to observe the planet. We've never seen ourselves the same since. ERTS-1—Landsat 1—was the first of seven satellites in the Landsat program, which has continuously recorded our planet for the last forty years. According to NASA's, the program was inspired by the ominous photographs taken by astronauts from space that showed us the first images of Earth from without. Can you blame us for wanting more? Can you imagine what it was like to see the Earth from space for the first time? The same curiosity that sent us out into space to try to learn more about distant galaxies suddenly left us with an unquenchable urge to stare back at ourselves. Landsat 1 beamed data back to Earth for six years, and was instrumental in halting—or at least slowing down—the ecological disaster in the Amazon by giving us the first comprehensive and horrifying images of Amazon deforestation. But despite all the important information the Landsat program gives us, the program has always been in jeopardy because it's very expensive to run. As CNET points out, NASA even tried to commercialize the program at one point to make back some of the money it was burning on the program. Luckily, the government has always seen it fit to keep it going. Landsat 7 has been actively returning data since 1999. Next year, the program will evolve with its next generation satellite, the Landsat Data Continuity Mission, which will return important data for the foreseeable future.